I love blueberries. I'm really into them right now and lucky for you, I've got a new way to try them. 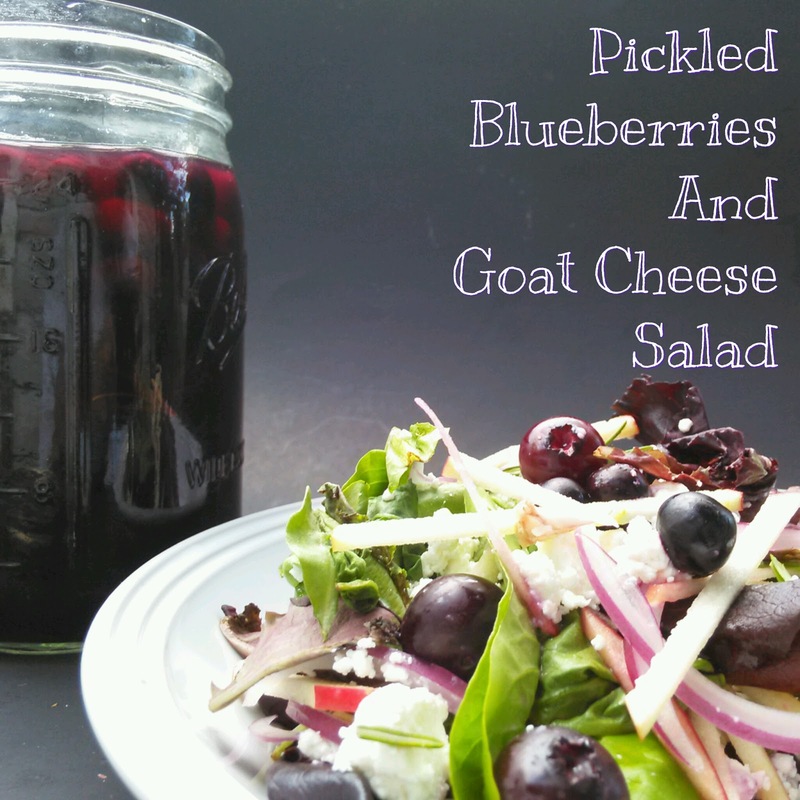 Have you ever had pickled blueberries? 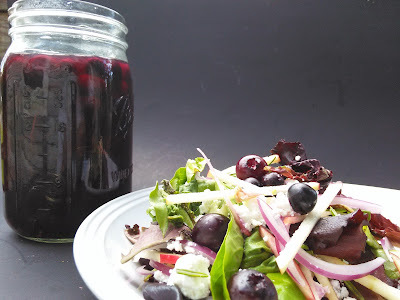 I'm entering my Pickled Blueberries And Goat Cheese Salad into the 2016 Wish Farms 'A Blueberry Toss' recipe contest. Wish Farms is a Gold Sponsor of the 4th Annual Food Wine Conference in Orlando, Florida. 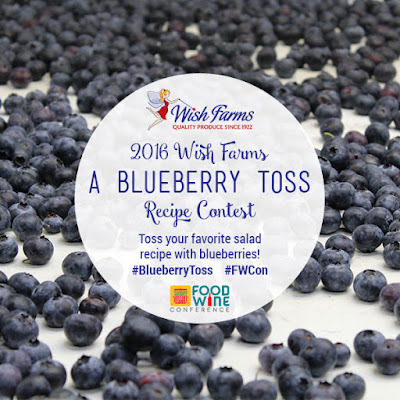 The and the requirements for this contest: Develop an original, creative salad recipe and include at least 1 serving of fresh blueberries. Well, if this salad isn't creative, I don't know what is! Enough about you. It's my turn. I mean, my salad's turn. 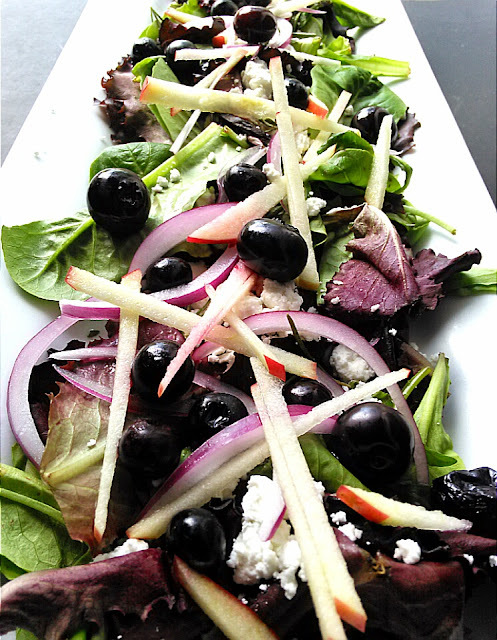 The star of the salad is the aromatic sweet and sour blueberries which burst with flavor as you crunch down on the sliced red onion, crisp matchstick apples and the creamy goat cheese crumbles. Fresh rosemary, sage, thyme (yeah, yeah; I know...no parsley) and dill provide an aromatic base along with black peppercorns, mustard seed, vinegar and granulated sugar make those blueberries pop. Ready to make the salad? Me too. And it's delicious! Wish me luck! 1. Add the vinegar, water, sugar, peppercorns and rosemary, thyme, sage, dill and mustard seeds to a medium saucepan and bring it a boil. 2. Rinse the blueberries and add them to a clean quart jar. 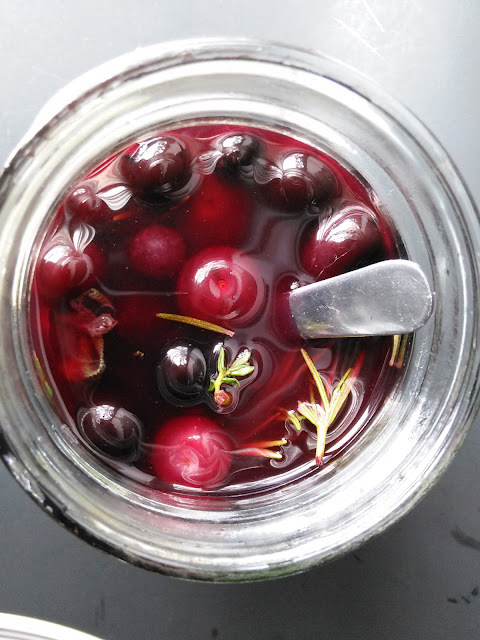 3.Remove the saucepan from the heat and pour the brine over the blueberries, covering them entirely. 4. Allow berries to macerate for at least 3 hours or overnight before using. The berries will keep up to 1 month in the refrigerator. Toss the mixed greens, blueberries, goat cheese, apples and red onion in a large bowl. Toss until evenly coated. Season with salt. Saw this and was intrigued. Never heard of pickling blueberries. Rushed out to get some ingredients and just finished putting a batch in the fridge. The brine smells heavenly. Can't wait to try them with the local (Prodigal Farm) goat cheese I also bought. Ok. Gave the blueberries a couple of weeks to adequately macerate. Worth the effort. Transformed the salad. Have a little left and may try on some vanilla ice cream.